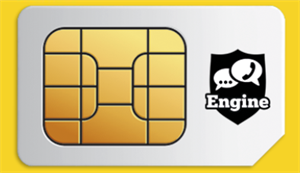 - The Engine Mobile SIM works exactly like a SIM from any network. In any Phone. With no need for an App. - All calls and texts, incoming and outgoing, are recorded for review by the supervising account holder. - Individual callers can be blocked or reported at the press of a button. - The recordings cannot be bypassed and the phone needs no special configuration. - All recordings are safe and secure in the online portal with manual or timed destruction. - The phone can be tracked using Geolocation technology. - MMS (picture messages) are completely blocked. To reduce the ways that your child could send, or be sent, inappropriate images.